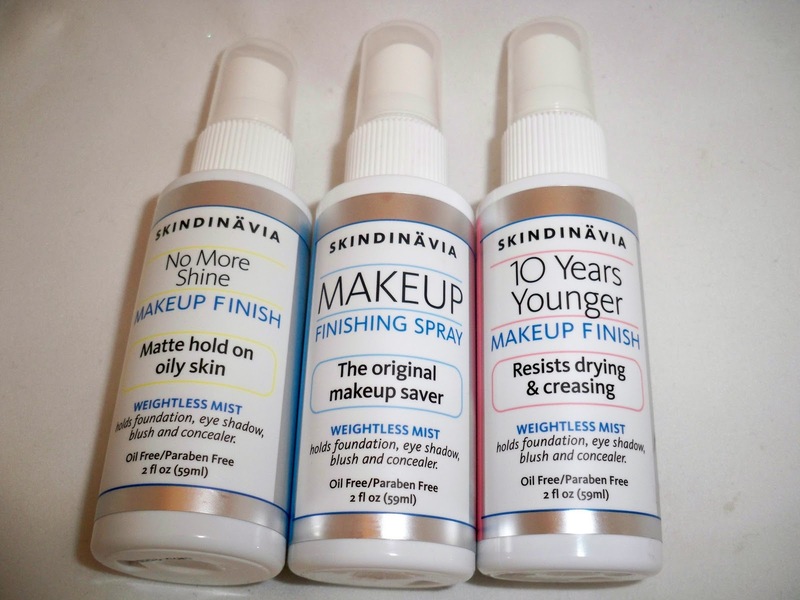 Home SKINCARE Skindinavia Makeup Finish Sprays - Review & Giveaway! Skindinavia Makeup Finish Sprays - Review & Giveaway! I'm back with another review. These products have been on my list for a really long time. 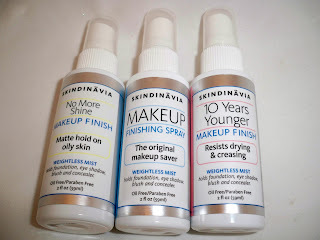 Today I'll be featuring the Skindinavia Makeup Finishing Sprays. I have seen lots of reviews on them and I really wanted to purchase them at IMATS Pasadena last year but never got around to it. Finishing Sprays are one of those extra special products that really steps up your makeup game. What's the point of spending so long on a look if it doesn't last? That's what these sprays are meant for. In this video I show you the products and my review. I'll also give a typed review for those unable to watch the video. I received three different sprays to try - No More Shine, Original, and 10 Years Younger in the 1 oz bottles. These are actually the company's best sellers. Each one has its own purpose and really there's one for everybody. There are actually a total of six different sprays to choose from including the Bridal Makeup Finish, Cool Flash Makeup Finish, and Dance! Makeup Finish. I've tried a bunch of different setting sprays - MAC Fix +, Pur Minerals Fulvic Mineral Mist, Model in the Bottle Sensitive and Regular Formula, Graftobian Setting Spray, and Kryolan Fixing Spray. They all have their different purposes and advantages. Enkore Makeup did an awesome video on telling us the difference between various facial sprays. It's a great video to watch. I find that I mainly use MAC Fix + and Model in the Bottle in my kit. I save the theater brands for Halloween and Theatrical Makeup. I wasn't exactly over the moon for any of them, so I was excited to try something new. In the video, I compare the Skindinavia sprays to what I own. I find that MAC Fix + is great for getting rid of the powdery makeup look but as far as staying power it's just okay. It's better as a refresher. I use Model in the Bottle for brides and other clients that need their makeup to last. It is more of a veil that covers the makeup. I have to be careful though because of the strong alcohol scent and sticky residue. All of the sprays seemed to "set the makeup" at first contact. It took away the powdery look and made the skin seem more radiant. I can definitely say that wearing the makeup spray makes a difference. One day I went without spray on one half of my face and the Original Spray on the other half. I was wearing blush and within one hour the side without spray already faded and the side with spray remained vibrant. Now that I know it works...let's break down the different sprays. After comparing it to the Original Setting Spray, I noticed that my face definitely seemed more matte as compared to the other side. It didn't have the regular shine to skin but it just seemed more flat. I wouldn't say it was overly matte but it definitely controlled shine. This is the original makeup setting spray and is pretty universal for all skin types. It sets makeup and holds it up to conditions like heat and humidity. It kept my skin oil free, but it gave me the dewiness of regular skin that I like. I can definitely tell that this spray has more moisture properties than the other. This is great for older skin and anyone with drier skin due to skin type or the weather. It's also supposed to prevent slippage into wrinkles and pores which is awesome for more mature skin. I'm not sure if this reverses the aging process but it definitely helps you look younger! Recommendations: I would recommend in the winter the Anti-Aging Finish because of dry, flaking skin. The 1 oz size bottles are perfect for any makeup artist's kit or for travel or if you just want to test it out. The larger sizes are great to keep at home. For summer, definitely try the other formulas which help resist makeup melting from heat. I think this product is also great for your kit when you're working with talent that has to be under hot lights such as photoshoots or tv work...it'll help refresh and revive the makeup. Skindinavia has agreed to generously sponsor two 4 oz bottles of any finishing spray of your choosing. FTC Disclousre: Products provided for review. I am not affiliated with the company and not paid to write this review. These are my honest thoughts and opinions. I would like to try out the 10 years younger one because my skin is very dry and this would be great to win and try this out. I would like to see it my skin look more dewy glow to it. My user name on YT is trinbagolino...I would like to win the orginal makeup setting spray because I have combination skin and I live on a Caribbean Island and a setting spray that actually works will do wonders for my makeup. I would like to win the original. As a teacher, I am constantly moving on my feet. This will allow me to look polished all day long. I would love to try the 10 years younger or the oily skin formula. I am 30+ with very oily skin. Nothing that I have tried thus far has worked to combat my oily T-zone without drying out my skin which can tend to cause pre mature aging. I would like to win the original spray. I have very oily skin and often my makeup looks very matte. i would like to win No More Shine coz i have oily skin..thanks! I would like the original because i have combo skin but don't want to be totally matte. I'd love to win the original one for every day use! I have oily skin but I don't want to look too matte. Thank you for throwing this giveaway! I don't know if you've already been tagged, but I've given you an award! I'd love to win the no more shine so bad!!! I was looking for something like that before summer comes round and my make-up gets blahhh. It would be super cool to use this instead of layering powder on my skin. I'd lik to try No More Shine!!! I'm super oily. My makeup starts to melt after I've put on for half- an hour! I would love to check out 10 years younger, because I'm extremely dry skinned and i have been searching for a setting spray that works with my skin . I'd like to win the original one because my skin is quite dry and I don't need a very matte finish. I would like to win the original one OR the oil control one. Same days I have normal skin while some days I have oily skin. I would LOVE to try them out so I can recommend them myself. I would LOVE to win either the original on or the one for oily skin. I have normal skin on some days and oily skin on others. I would love to try these out. I've been wanting to get a setting spray but I don't know which one to get. This would be a great product to start off with. I would love to win No More Shine Makeup Finish, it will come in great use this summer when my skin is extra oily! Thank you so much for this giveaway! I would love to try the original because I have normal skin and would love to see if it could actually make my makeup last longer! Would love to win the 10 Years Younger spray considering my dray skin as well. I usually use a theatrical brand version from Cinema Secrets, and out of all the theatrical brands this is the cheapest but they are work identical on me. Like Model in a Bottle it has that distinct alcohol smell and carrier. I find it can when using it daily since it aggravate my skin over time. My skin also is very sensitive and I constantly have test items to see if my skin likes a product or not. I would really like to win the "No More Shine" because my face is incredibly oily, and my makeup certainly does not last the day! I am subscribed to your blog via GFC as Ezzy and on youtube as lilbitssofeverything. I would really love to get No More Shine Makeup Finish Spray considering my super oily skin and how I am exposed to heat and have to bear with the sweat mixed with my oil. I hope this helps me. I'd love the original one. First I thought I should say the oil control one, but I like there to be a natural glow to my makeup...so didn't want something to make me completely matte. I would love to try the 10 Years Younger spray because this winter has been especially harsh in the northeast and my skin is normally dry, but now it's super flaked out dry. Foundation has become a challenge with this dry skin. I would love to have more summery looking skin. I subscribe to your youtube channel (user: twiggskitty) and I follow here as tracy@mybestbeauty buys. I would love to try the original one, I think it sounds like it would help my make-up last without looking over dewy. Thanks for the giveaway! I would love to really try any of these. I currently use Mac fix+ I love it but I want to try something else. I think the 10 years younger one sounds interesting. I own a setting spray by urban decay that i just LOVE but never really knew that there were such a wide range of types from other brands. Since i have oily skin i would love to try the no shine! Thanks Ren!! I loveee to win the No More Shine Makeup Finish because I have really bad oily skin.When I do my makeup it looks good for the 1st hour but after that it looks so nasty that I have to take my makeup off and do it gain.I want to try this product before buying it that way if it doesn't work for me I won't buy it and my money doesn't go the trash.Thanks Skindinavia for doing the giveaway. Hi Renren,I just posted a comment under susypatron69 and forgot to mention that my user name in Youtube is Azucena61. I want to try the Original. My blush slides off and vanishes after an hour or so two and I want something that doesn't smell like alcohol but works! I would love to win the spray for aging skin because I'm 28 and my skin gets pretty dry. I would love to try "No more shine" spray and "10 years younger" formula! Thanks! It would be great if I could try out the Original Skindinavia Skinfinish since I find my makeup melting away by mid day and looking dull. Hopefully the spray keeps it looking lovely for as long as I'm out, thanks! Following through Google Connect with the name evieness. I would love to try out the No More Shine Makeup Finish..No matter what type of foundation I use, I'm always battling shine..
Hey Ren Ren i love your videos :) I would like to win the "ten years younger" spray bc I NEVER WIN ANY CONTEST!!!!! ..lol Plus ive always wanted to try a finishing spray just too scared and broke to spend $18 on something that i wasnt sure would work.﻿ I have very dry skin so i tend to stay away from powders in the winter but maybe this will help with that. I would like to try the anti-aging spray. I want to learn if it's worth its hype. I'm an aspiring makeup artist myself and would love to have an opportunity to try a product that you've reviewed. I'd like to win the No More Shine please. I can't get my makeup to last to save my life and would like to see if this product would help. Hi Ren. I'd Like To Win The Original Make-Up Setting Spray Because I Have Never Used A Setting Spray On Myself Or Clients. I Would Want To Be Able To Go In The Club & Not Have Mine Or My Friends Make-Up Sweating Off, Thanks For This Giveaway. I'd love to win the "No more shine" one because I have an extremely oily T-zone and I think this will definately help me control that! I'd like to try "10 Years Younger " because I'm over 34 years ,and my skin seems to be drier. Hi i would love to try the shine free oil control one! i have really oily skin and have heard really good things about how it controls oil and would love to have it in my collection! i always wanted to try the no more shine finishing spray because throughout my whole teen years ive always struggled with a very very oily face. I would love to win the original because it is for all skin types and also you can use it for everyday. Love your giveaway I hope I win. Hey Ren Ren i love your videos :) I would like to win the "ten years younger" spray bc I NEVER WIN ANY CONTEST!!!!! ..lol Plus ive always wanted to try a finishing spray just too scared and broke to spend $18 on something that﻿ i wasnt sure would work.﻿ I have very dry skin so i tend to stay away from powders in the winter but maybe this will help with that. Hi Renren, I would love to win the original spare. I would love to win bc I'm a stay home mom and I can't afford things that I want. My hubby the only one that work and the money goes to all the bills. I always enter ur give away but have never win so it would be really﻿ nice if I win. Thanks u! I would love to win the Original Makeup Finish because to be honest I haven't tried a spray that would help keep my makeup stay put and the past few weeks I've been looking up things that would help and I keep hearing about the MAC Fix + and now the Skindinavia. It's a hard decision because of the price range but none the less it would be a great opportunity to try a brand that you recommended. I love your tutorials! i would like to win the original ones. because i have combination skin, and i dont want look too matte, but dont want too looks to glowy T___T. i'm really really want to try the finishing make up spray. its very difficult to get the make up product, especially for make up finish. i'm really want to try the original make up finish. Winner! Sigma Makeup Sigmax Giveaway! Sigma Makeup Sigmax Brushes Tutorial & Giveaway! A Vision Board for the New Year! New Years Eve Pics - My Look!